Results from its first run indicate that XENON1T is the most sensitive dark matter detector on Earth. The sensitivity of the detector – an underground sentinel awaiting a collision that would confirm a hypothesis – stems from both its size and its “silence.” Shielded by rock and water, and purified with a sophisticated system, the detector demonstrated a new record low radioactivity level, many orders of magnitude below surrounding material on Earth. 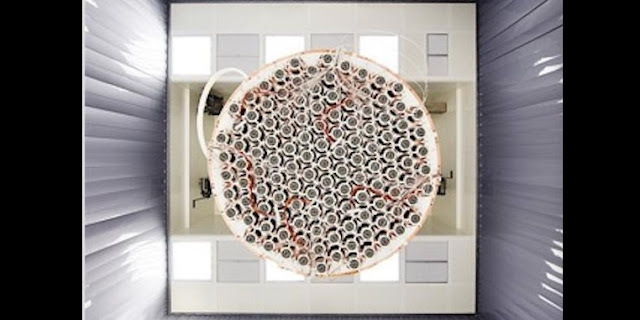 “We are seeing very good quality data from this detector, which tells us that it is running perfectly,” said Ethan Brown, a XENON1T Collaboration member, and assistant professor of physics, applied physics, and astronomy at Rensselaer Polytechnic Institute. In the paper “First Dark Matter Search Results from the XENON1T Experiment” posted on arXiv.org and submitted for publication, the collaboration presented results of a 34-day run of XENON1T from November 2016 to January 2017. While the results did not detect dark matter particles – known as “weakly interacting massive particles” or “WIMPs” – the combination of record low radioactivity levels with the size of the detector implies an excellent discovery potential in the years to come. Brown’s research is enabled by the vision of The New Polytechnic, an emerging paradigm for higher education which recognizes that global challenges and opportunities are so great they cannot be adequately addressed by even the most talented person working alone. Rensselaer serves as a crossroads for collaboration — working with partners across disciplines, sectors, and geographic regions — to address complex global challenges, using the most advanced tools and technologies, many of which are developed at Rensselaer. Research at Rensselaer addresses some of the world’s most pressing technological challenges — from energy security and sustainable development to biotechnology and human health. The New Polytechnic is transformative in the global impact of research, in its innovative pedagogy, and in the lives of students at Rensselaer.